Piso Fare 2015: PEACE-O fare! Bringing everyJuan together during the month of peace! As the National Peace Consciousness Month of September comes to a close, we support the message that wherever we may be, regardless of culture or religion, we can come together in peace and unity. Quoted DOMESTIC one way fare is inclusive of Php 1 Base fare, Php 120 Web Admin Fee, for flights transiting in or exiting from Manila/Cebu Station and 7 kg hand-carry baggage allowance, but exclusive of Fuel Surcharge ranging from Php 200 - Php 550 and check-in baggage. Terminal Fees ranging from Php 50 – Php 200 for flights originating from non-Manila/non-Cebu Stations must be paid at the airport. Quoted INTERNATIONAL one way fares are inclusive of Base Fare, Php 1 Base Fare, 120 Web Admin Fee, and 7 kg hand-carry baggage allowance but exclusive of Php 550 International Terminal ​Fees ranging from, Php 1,620 Philippine Travel Tax, Fuel Surcharge ranging from Php 675 – Php 5,400, , Country Specific Taxes ranging from ​Php 420 – Php 1,315 and check-in baggage. Promo fares have limited availability and are non-refundable but rebookable subject to the following rebooking fees: Php 1,200 for Domestic destinations and Php 2,000 for Domestic destinations, Php 2,500 for long-haul destinations plus fare difference. For your convenience, flight changes, availing of prepaid baggage allowance for check-in baggage and web check-in service can be done up to 4 hours before schedules flight. AVAILABLE NUMBER OF SEATS ON SALE PER ROUTE and v.v. DOMESTIC: MANILA TO Bacolod: 3,454; Busuanga: 460; Cauayan 4,429; Caticlan: 2,414; Cauayan: 335; Cebu: 9,526; Cotabato: 847; Davao: 6,015; Dipolog: 614; Dumaguete: 1,180; General Santos: 2,030; Iloilo: 5,702; Kalibo: 1,001; Laoag: 273; Legazpi: 2,389; Naga: 463; Ozamiz: 677; Pagadian: 754; Puerto Princesa: 2,201; Roxas: 677; San Jose: 256; Tacloban: 2,620; Tagbilaran: 677; Tuguegarao: 761; Virac: 335; Zamboanga: 3,235. CAGAYAN DE ORO TO: Bacolod: 115. CEBU TO: Bacolod: 942; Butuan: 862; Cagayan de Oro: 2,901; Camiguin: 273; Caticlan: 778; Clark: 253; Davao: 4,278; Dipolog: 273; Dumaguete: 273; General Santos: 677; Iloilo: 941; Kalibo: 354; Legazpi: 155; Ozamiz: 590; Pagadian: 273; Puerto Princesa: 590; Siargao: 273; Surigao: 902; Tacloban: 817; Tandag: 140; Zamboanga: 590. DAVAO TO: Bacolod: 294; Cagayan de Oro: 661; Iloilo: 639; Zamboanga: 670. ILOILO TO: Cagayan de Oro: 171; General Santos: 256; Puerto Princesa: 249. ZAMBOANGA TO: Tawi-Tawi: 861 and v.v. INTERNATIONAL: MANILA TO: Bali: 264; Bangkok: 1,171; Beijing: 388; Brunei: 485; Busan: 1,534; Dammam: 1,000; Dubai: 1,200; Guangzhou: 384; Hanoi: 281; Ho Chi Minh: 677; Hong Kong: 2,707; Incheon: 452; Jakarta: 1,069; Kota Kinabalu: 237; Kuala Lumpur: 1,391; Kuwait: 1,000; Macau: 677; Nagoya: 391; Osaka: 497; Phuket: 196; Riyadh: 800; Shanghai: 677; Siem Reap: 339; Singapore: 1,130; Taipei: 963; Tokyo: 677; Xiamen: 196. CEBU TO: Hong Kong: 677; Singapore: 193. CLARK TO: Hong Kong: 197; Macau: 295; Singapore: 278. ILOILO TO: Hong Kong: 220; Singapore: 113 and v.v. 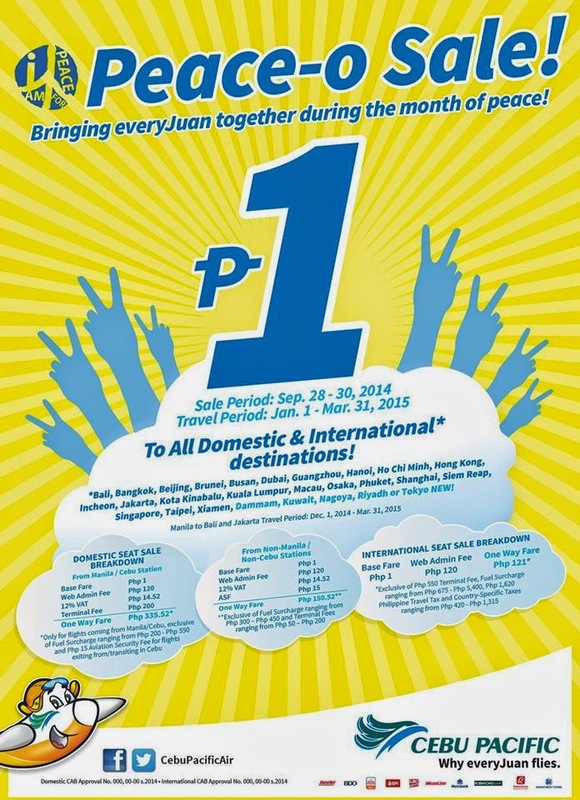 Book this #CEBSeatSale now at http://bit.ly/CebuPacificAir. Paano po ba ang pag book sa cebu pacific piso fare? Pcebu pacific piso fare?. salamat nga pala dito..
My available p po ba Davao to Palawan? Paano po ba ang pag book sa CEBU PACIFIC PISO FARE?
. salamat nga pala dito..
Hi, Thanks for inquiring. Pls. refer to the above post po. you may please do a mock booking po thru cebupacificair.com or visit any nearby ticketing office or agency or call these nos. for inquiry: Call (02) 70-20-888 in Manila, (032) 230-88-88 in Cebu or visit this FB page every once in a while regarding promo updates for your preferred trips. Thank you. what if booking here is just a fake ? whats our guaratee? May available seats pa po ba? Available pa po ba tong promo? April 18 2015 singapore direct davao piso fair available po ba? One way lang po. Hello po how much po kung magpabook ako sa Dec. 23 then balik Dec. 28 then may 2 y/o po akong ksma.. Reply po :) thank you! how about from tokyo to manila?